Keep calm and save the rain! In Texas, we’re only a dry spell away from another drought. State Climatologist Dr. John Nielsen-Gammon recently warned lawmakers that if rainfall stays below normal this year, parts of Texas could experience the drought of record. That means it could be worse than the one in the 1950’s. What does long-term drought have to do with rainwater harvesting? Well, the other predictable thing about Texas is that the rain will come again. When it does, rainwater harvesting is an excellent way to make water work double-time for you. 43,700 gallons off your roof? Here’s how rainwater harvesting breaks down: The Bryan-College Station area receives an average annual rainfall of 39 inches. If we captured every inch of rainfall that fell on a 2,000-square-foot roof for a year, we’d collect 43,700 gallons. Collecting rainwater in barrels or cisterns is an excellent way to extend our precious water resources. After a generous rain, you don’t need to water your landscape for a week or more. When it’s time to water again, you’ll have a ready supply of water that doesn’t cost a dime — except for the equipment to divert and collect the water. Rainwater collection can be as simple as a sturdy 55-gallon food-grade barrel (covered to prevent mosquitoes and painted to prevent algae growth), or as extensive as a galvanized metal cistern that holds thousands of gallons. 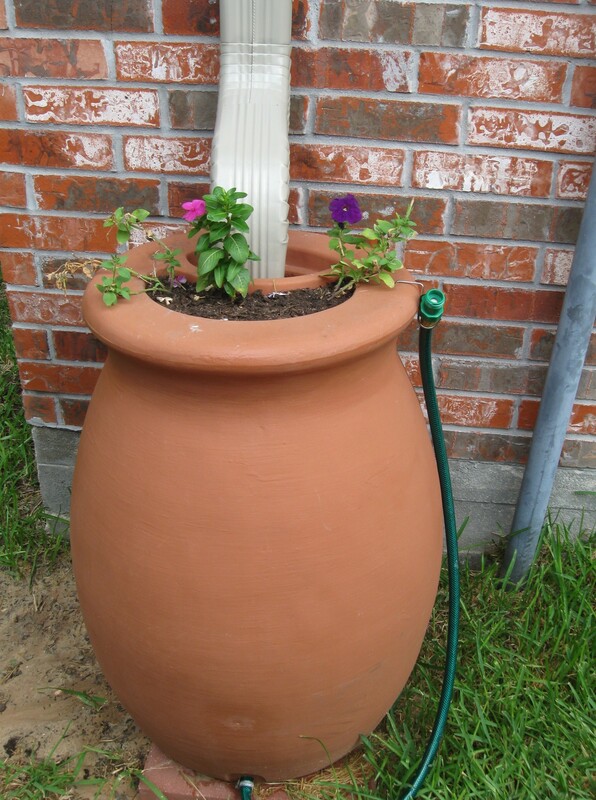 As an incentive, the City of College Station offers rebates of up to $25 per barrel for rain barrels 30 gallons or larger. Your rain barrel doesn’t even have to have rain in it to qualify for the rebate — it just needs to be hooked up and ready to receive rain. Rain barrel rebates are available year-round, subject to funding, whether it rains or not. Interest in rainwater harvesting always seems to peak after a rain event. When the rain returned in March 2012, we received more rain barrel rebate applications that month than we did the entire previous year. Rainwater collection equipment is also exempt from state sales tax if you show the merchant your Texas Sales and Use Tax Exemption Certificate when making the purchase. Several businesses in our area as well as online retailers supply cisterns of various sizes and styles. Examples of rainwater harvesting in action can be found at the Brazos County Master Gardeners’ Demonstration Idea Garden (D.I.G.) on State Highway 21, the new Agriculture & Life Sciences Building on Texas A&M’s West Campus, and the College Station Utilities’ Meeting & Training Facility on Graham Road. If you’d like to learn more about rainwater harvesting, we’ll have an exhibit at the Brazos County Master Gardeners’ water conservation seminar on Saturday, Feb. 16, from 9:30 a.m.-2:30 p.m. at the Brazos Center. I’d be happy to answer any questions about how you can become a rainwater harvester! This entry was posted on February 14, 2013 by City of College Station. It was filed under Public Communications, Water Services and was tagged with rain barrel rebates, rainwater harvesting, water, water conservation.